Short Cut Program Generator (SCWin) is a free, menu-driven, PC-compatible software package that simplifies the creation of datalogger programs; it creates a datalogger program in five easy steps. Does CRBasic have to be used to program a data logger? 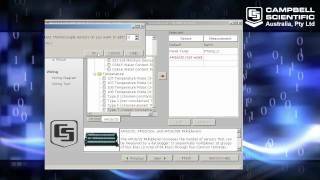 Does a menu-driven program generator exist for the data logger? 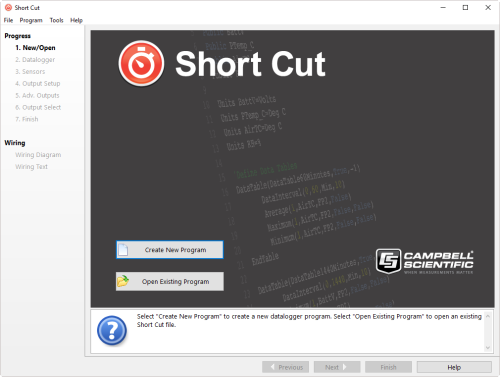 A free program generator for all Campbell Scientific data loggers is Short Cut for Windows (SCWin). Short Cut can be used to create programs in many situations where Campbell Scientific equipment is used. The Campbell Scientific YouTube channel has a two-part series on using Short Cut. In situations where program requirements are too complex or specialized for Short Cut, programs can be written in any text editor that can edit and save plain ASCII text. However, creating an error-free program would be very difficult. The CRBasic Editor that comes with PC400 and LoggerNet provides a programming environment with procedure templates, integrated help, programming examples, the ability to test compile the program before sending it, and many other features that can be very helpful when developing a program.